So there I was full of adrenaline after the last performance of House Amongst The Willow in November 2016 when the conversation back stage driven by Tony and Aurea, comes on to the subject of what shall we do next year? 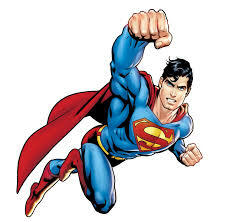 Another comedy play is suggested and then the inevitable question is asked “well, who is going to direct it?” Now there I am sitting there thinking wow, I’ve just done the biggest play of my life, I can do anything… in fact I’m Superman! And before I know it and without any conscious thought going through my head at all I hear myself say, in my best Superman Voice “I will direct the next play” finished with a Tarzan yodel (inside my head I think). Tony said “great idea Rich” Aurea nodding profusely saying brilliant! Voice in my head saying “really Rich”? and my Superman ego feeling like it just had a kryptonite suppository! Anyway months pass, we do Songs and Sketches at Christmas a Panto in February and I attend the next Blackham committee meeting with an agenda item Autumn play Blackham & PADS, Rich Directing. 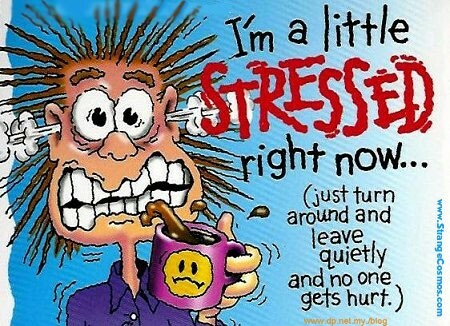 Queue another kryptonite insertion and some serious positive self-talk. You can no longer be selfish. As I director you have to worry about your whole cast as well as having to know the play better than anyone in the cast. This includes where they are to stand, where the props are going to be, how the set will look and the actions between lines. A good tip I was told (thanks Tony) and have practiced is to have the set of the play drawn on paper and have smarties representing characters so that you can move them around the paper drawn set as you go through the script. With 11 cast members that is sometimes essential but be warned half way through the script you can find you’ve eaten half the cast! Finding a few plays to recommend to the committee can be a difficult process that cannot be taken lightly. You have to read a great many scripts before you find one or two that you think you can direct. The rule of thumb for me is when you read a script you have to feel sufficiently engaged by its subject matter style and characters. The play you choose has to motivate you and engage you from the off. Your motivation and enthusiasm has to filter through to your cast and carry on all during rehearsals. When choosing a comedy play my other rule of thumb is if it makes you laugh out loud in a crowded train carriage then it will surely make the audience laugh out loud too. However one of the downfalls is that passengers on the 6:55 to London Bridge now avoid me like the plague. When reading a play and having had the opportunity of working with some great actors from two amateur dramatic societies it would be a lie to say that when you hold a casting you do have certain people in mind for certain roles. You do need to keep the mind open though as you can change your mind on the day as I did. There are many ways to cast but I chose taking sections of the play and having the auditionees read through in a group. You get a quick feel quite quickly how the characters will perform together and have the freedom to chop and change your cast members to read different roles on the fly until you get a good feeling what will work. Also you have to showcase and sell the play to the people auditioning as remember they are auditioning you as much as you are auditioning them. You have to enthuse them about your ideas for the play and convince them that they are going to want to spend two nights a week in your company being told what to do. Then there is the hard bit. Remember that if you have too many people audition they you are going to have to send that email or make that call letting people down. That was something I hadn’t considered and having a heart made of jelly was tough to do. You are the first man in and last man out the hall. When being a member if the cast going to rehearsals myself I used to turn up (well ahead of time) and find the stage set up, chairs laid out and the kettle boiled with biscuits and cake to munch. My first night as Director I realized that actually I was having to be the first one there, unlocking the hall, setting up the stage and putting the kettle on ensuring that there was ample cake and biscuits for a ravenous pack of wolves as well as having to be the last guy there locking up afterwards making sure all the lights were off. I quickly found out that you cannot effectively direct a play whilst having your eyes on the script. You cast needs you to play close attention to what they are doing and for you to pick up any cast positioning on stage. Also the nuances of the scene and what is said needs you to direct the cast on how to act based upon how the audience will see it. I have been lucky enough to have a willing victim, sorry volunteer take on the role as an introduction to joining am dram (thanks Lyndia). She is a godsend by freeing me up to keep focus on what is happening on stage. I have found not only as an Actor but as a Director that stage directions act as a good guide as to how the author perceived the play being performed but sometimes need to be altered as they don’t fit the way you see the play or (as in the case of the Blackham stage) need to be changed due to size limitations. Also the directions within a play do not go granular enough to include whether it is downstage front or centre stage left, the emphasis on the character or what other should be doing at the same time. 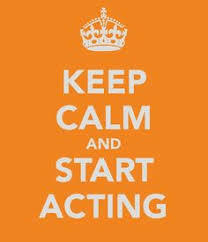 The little nuances and movements that makes the play real and funny have to be thought out and practiced. In our play we have spent nearly a whole rehearsal practicing one 5 minute interaction that is not only very funny when done right but has a lot of complicated direction and interplay with the 6 people on stage. Getting it right makes it look not only very funny but allows everyone to be in the right place for it to flow smoothly. If we get it wrong we will require an ambulance and potentially 3 new members of cast! You will have to come and see the play to see why. Oh yes there will! I didn’t believe it when I was told but trust me I believe it now! Things can go wrong, you may have to change cast or they may come a time when you stand there and your cast looks at you and say ‘where do I stand now’ or ‘what do I do now’, or ‘what exit to I use’? 95% of the time you know but there will be times when you will look at them with a blank, search me, expression. You do get over this however and carry on and it feels great. It wouldn’t be fun if it wasn’t challenging would it. However there is a lot of good feeling when actually as a team you have worked something out and it all works. This is when you think I can do this and you remember why you enjoy am dram. Well that is all I have to say for now other than to say please come and see the play for yourselves and see how well it is performed by the Cast. Without such a talented bunch of people at Penshurst and Blackham, this play would be much harder to direct that it really is and it is their own input and ideas are really making this play as funny as the scriptwriters intended..
As for me, I just supply the biscuits, stand at the front and pretend I know what I am doing. 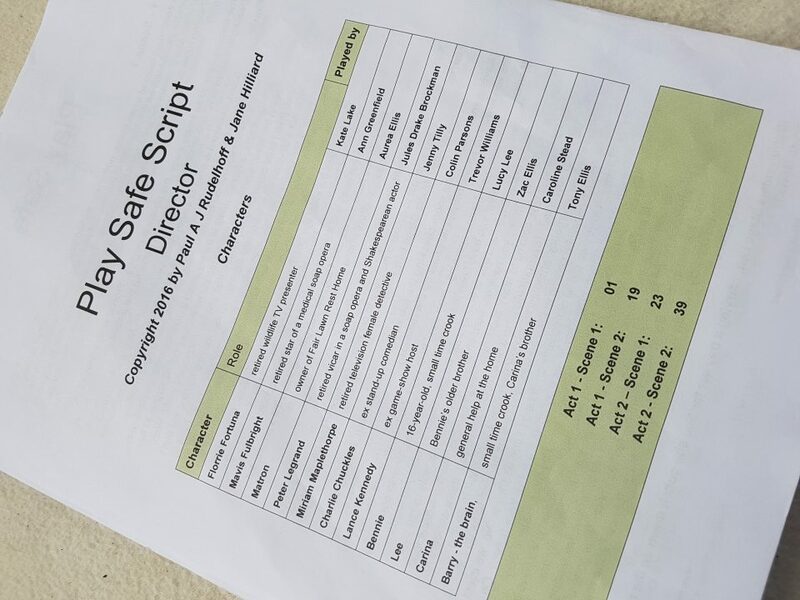 Play Safe is being performed at 8pm on November 10th & 11th at Penshurst Village Hall and on the 17th & 18th at Blackham Village Hall.